The Frooti pack image that is added here is a new version of Frooti. When it hit the markeet inthe late 80s / early 90s, the drink came in a green pack. The song "Mango Frooti! Fresh and Juicy" is still fresh in my memory. Watching that ad in the old Bush TV in our house in Doordarshan brings me some great memories of those days. The Frooti pack was priced at Rs 3 at that time and it was a costly drink. My sister was a big fan of frooti. She would always buy frooti. Me, being a boy always opted for Gold spot. I treated Frooti like a girls drink and I would consider that only boys were capable of drinking aerated drink. Yes I was against gender equality. I would try to drink Gold spot in one gulp, but always failed to do that. Holding the goldspot bottle in one hand and drinking it was supposed to be a cool act back in the late 80s. Those who have done that will understand what I am talking about. 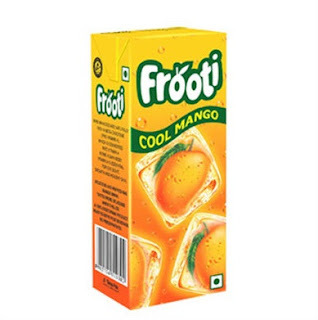 Though I did not like Frooti, I always collected the pack after my sister completed drinking it. I would then inflate the pack by blowing through the hole in the pack, keep the pack on the floor and jump on it and it would explode with a loud noise. How many of you have done this? The fun with frooti is not in drinking it; the actual fun lies in bursting the pack. This morning I read the news about rebranding of Frooti. The news pulled me back to my childhood days. Do you have such memories with Frooti?